The elegant bedrooms and suites, with or without terrace but almost all with lake view, have 5-star luxury and comfort and different styles, from Liberty to Venetian. Two very spacious suites (50-60 square metres) on the top floor boast a breathtaking panorama and private wellness area with Jacuzzis and massage beds. The “Maximilian” Restaurant is the setting for incomparable candlelit dinners and summer service on the magnificent terrace with lake view. Total relaxation awaits you in the Pevonia-affiliated wellness centre, with sauna and hydro-massage tub and a wide range of beauty treatments, massages, mud and hot-stone treatments etc. 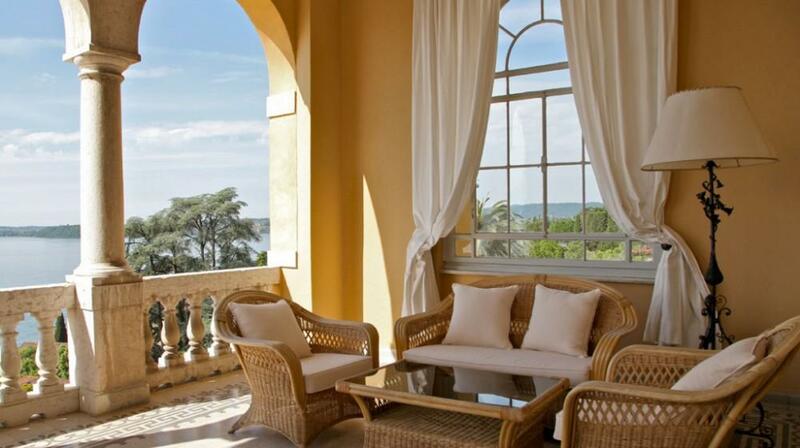 Or you can simply relax by walking along the narrow lanes which snake among delightful villas and sumptuous gardens. Nature and art are blended, creating a unique environment with an ancient flavour, such as the fabulous Villa Alba and the original Hruska botanic garden which has over 500 species of plants, sculptures by famous international artists and, during the summer season as in the Vittoriale cittadel – numerous events, shows and artistic happenings. 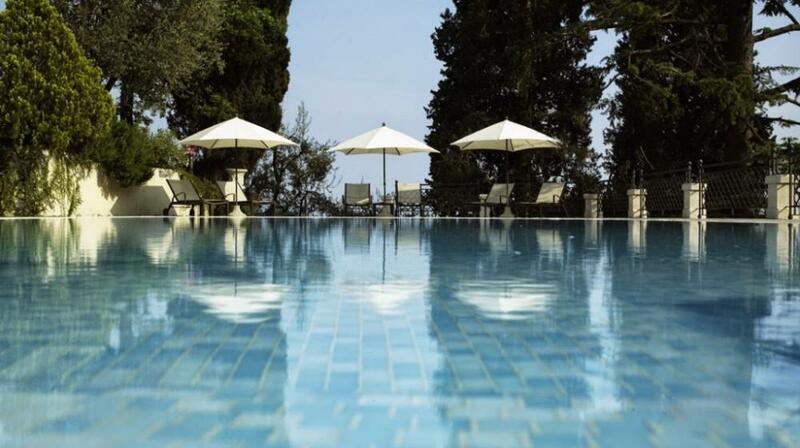 with double bed or twin beds with view to the northern part of the Villa. Bathroom with tub/shower furnishing in style, carpet or wooden floor. double rooms with double bed or twin beds, lateral view of the lake. with double bed or twin beds, front lake view, bathroom with tub/shower furnishing in style, carpet or wooden floor. 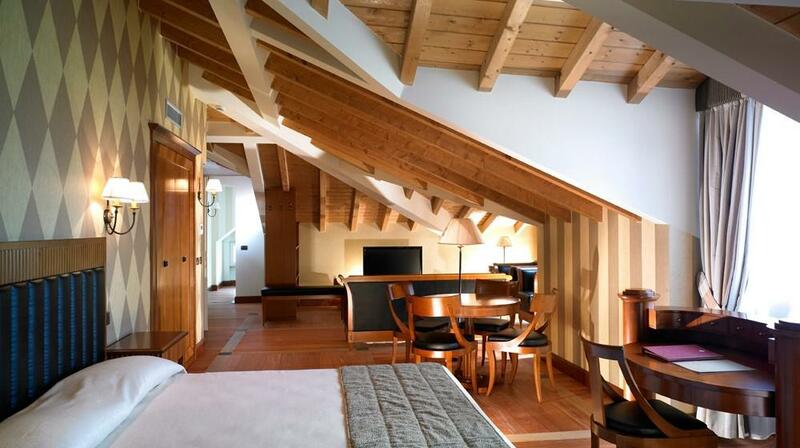 with double bed or twin beds, below the main terrace of the villa. All have a 9 MQ large terrace with lake view with dining table. Bathroom with tub, furnishing in style, wooden floors. Large Suite, 60 MQ, on the top floor of the villa with a private wellness centre of 12 MQ with Jacuzzi, massage bed and a 18 MQ large terrace with a breathtaking view of the whole lake and the surrounding mountains. Its furnishing is in Biedermeier Style with wooden floor, marble bathroom with shower. Bathroom with bath, style furniture, carpet or wood. Large double rooms with double bed or twin beds with lake view and lounge area, 30 MQ, small covered 2 MQ terrace. They offer a breathtaking lake view . In clear days it seems to see the Venice lagoon in the distance. And even the Venetian Style inspires the furnishing of the rooms. 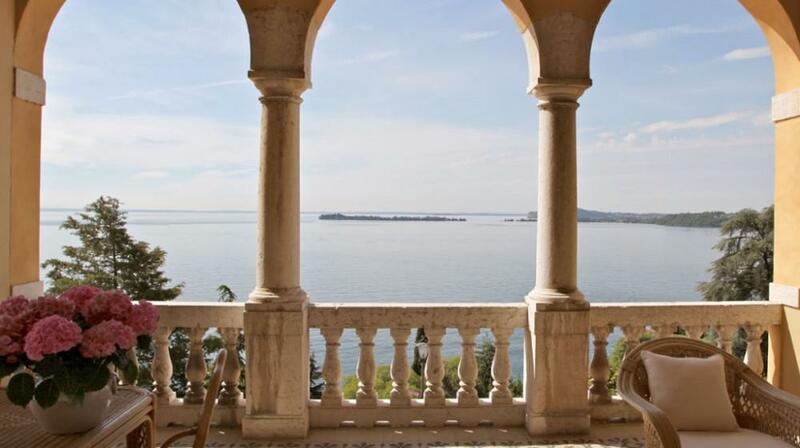 Large room in Venetian style, MQ 20, with a fabulous covered 25 MQ large Loggia (covered terrace) with lake view, living room with dining table. 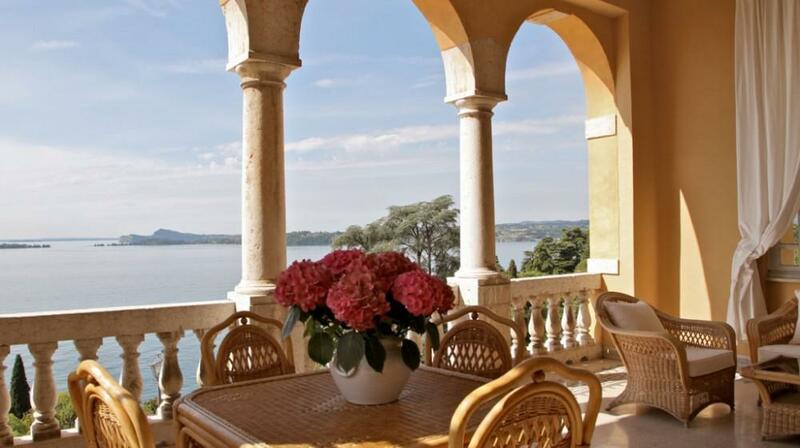 At the time of Villa Garda it was used as a dining room. Carpet floor. Bathroom with tub/shower. Large Suite in Liberty style, 60 MQ. lake view without terrace on the ground floor of the Villa, it was once used as a billiard room. It has a large glass door which separates the living room from the sleeping room together with a large fireplace in style. Bathroom with Jacuzzi. Original wooden floor. Large Suite, 50 MQ on the top floor of the Villa with the Tower , in which a 12 MQ wellness centre with Jacuzzi and massage bed has been created with access to an exclusive 20 MQ large private terrace on the roof. 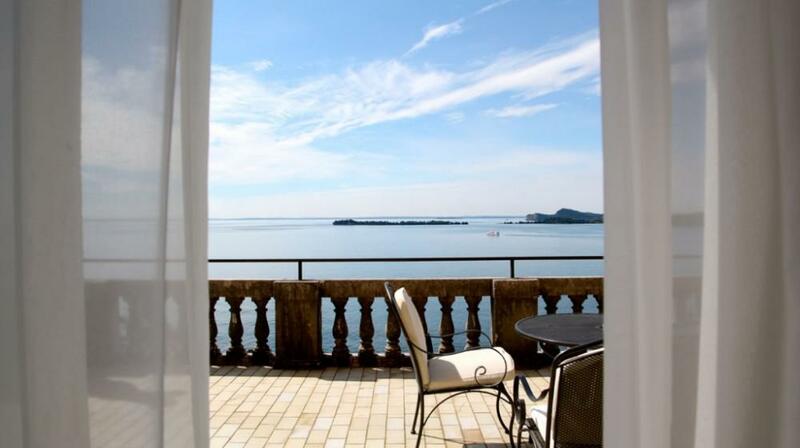 You can enjoy a breathtaking view of the whole lake as well as the beautiful Vittoriale, the house of Gabriele D’annunzio, to which the furnishing of the room has been inspired. His Opinion: tolles hotel in unglaublicher lage. das frühstück ein traum und die mitarbeiter so zuvorkommend und freundlich wie ich es noch nie erlebt habe. danke für diese wundervollen tage voller luxus. an das silbergeschirr könnten wir uns gewöhnen. ebenso wie an den ausblick aus dem zimmer...ein traum. absolut zum weiterempfehlen...5* in jeder hinsicht.